A number of dental patients come to us requesting to upgrade their silver fillings. They want their old metal fillings removed and substituted with tooth-colored fillings. Patients commonly cite esthetic and overall health considerations about their metal fillings. It happens to be true that the esthetics of a smile could be significantly improved using a more natural, tooth-colored restoration. In addition to this, there are lots of good reasons that would explain why it’s smart to upgrade to a tooth-colored porcelain “filling” or perhaps a resin composite filling. Almost everything wears away, and your silver fillings will not be any exception. They endure stress-filled and heavy biting forces every day, and as they age, they will crack, leak and may cause damaging fractures on teeth. With time, metal amalgam fillings have the ability to absorb water, causing them to swell and even break free from the tooth. At this point, your tooth is much more liable to decay and tenderness. • Silver fillings are much less appealing than natural-colored fillings. The bare truth is, they don’t in the least resemble a natural part of the tooth. • Amalgam expands and shrinks whenever exposed to cold and hot extremes within your mouth. The frequent expansion and shrinkage through temperature might set off cracks and fractures in your teeth. There may not be any sort of indicators for a while, but these teeth may become very sensitive as the crack expands or opens if you bite down or chew food. It is not uncommon for patients to come in curious about how they broke their tooth while they had been eating something soft like a banana or slice of bread. What they don’t realize is that the tooth almost certainly had a crack in it well before it eventually came apart. • Silver fillings that are under continual chewing stress are at risk of metal fatigue or flexing and bending failure, a concept which may be fully understood and confirmed by repeatedly bending a metal paperclip until it finally breaks. 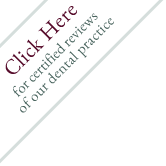 • Metal fillings are harder and far less flexible than the teeth they’re pressed into. 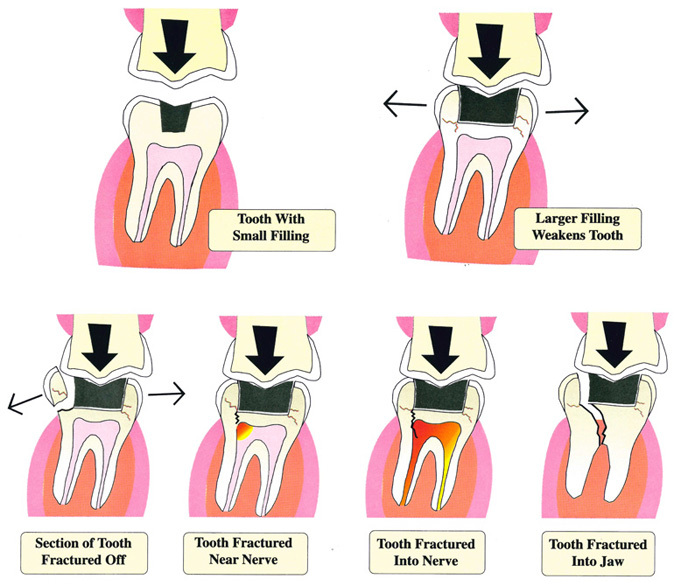 The more time they may be in the teeth, the more force they will put on the rest of the weak outer surfaces of the tooth leading to fractures and cracks. • Metal fillings are not glued into the cavity. They merely sit in the surrounding tooth and react under pressure to wedge the tooth apart, like a metal wedge is required to split logs for firewood. • A microscopic gap surrounding the filling edge is present as soon as your silver filling is plugged into the tooth; and within this space, normal leakage and corrosion occurs. This unnoticeable gap is large enough to allow harmful bacteria and food particles to enter in over time and lead to decay at the joint between the filling and the tooth. Composite fillings, however, are essentially glued to the tooth surfaces and seal the margins closed from invading bacteria. • Silver fillings necessitate drilling undercuts (think carving out a pumpkin) along with removing larger good parts out from the tooth to be able to keep the mercury amalgam filling from falling out as it is not bonded straight to the tooth. These types of undercuts also can compromise the tooth as fillings get bigger and doom that tooth to upcoming cracking later on. These cracks might be substantial leading to crowning the tooth to restore it or even major cracks leading to extraction of the tooth. • Composites, utilizing their opportunity to be conservative and applying their gluelike properties, can strengthen and protect against fracture. By simply intercepting the chance of fracturing prior to experiencing the hassles of hot/cold sensitivity as well as biting pain, brand new conservative treatments like natural-colored restorations or porcelain-bonded restorations are actually protecting against the unwanted effects of toothaches and damaged teeth. • Finally, many dentists say that, bonded tooth-colored restoratives are safer compared to classic fillings, simply because they do not include any mercury. Although the American Dental Association (ADA) suggests the utilization of mercury in metal fillings is safe, there is an ongoing debate within the dental industry concerning the unwanted effects of those mercury amalgam fillings. Several of the European countries actually prohibited the utilization of mercury amalgam fillings in order to avoid any sort of risks linked to mercury. Considering the amount of negatives associated, and potentially associated, with mercury amalgam fillings, it’s no wonder that patients are directing us to be PROACTIVE about disposal of mercury fillings instead of being REACTIVE and waiting until something goes wrong with the tooth.